Stock Car Extreme: v1.38 released! Updated off-track & rumblestrip sounds in closed cockpit cars. Improved: Cars are no longer prone to explosions from small arms fire. Explosive shells & devices are now required to blow up cars. Fixed: Collecting Zeus Intel objects force-opened the map on all clients. Now it happens only for the person who collected the Intel. We provide fully Immersive Virtual Reality Education experiences to help educate students of all ages. We will cover a wide range of subjects including History, Geography, Biology, Mathematics, Medicine, Astronomy and Science in an engaging and fun manor which will inspire a new hunger for learning with our users. We plan to release new content regularly which will focus on key days in history or focus on hard to visualize subjects. And that’s not all! On top of all that goodness above we’ve also made the following additions and changes to DiRT Rally. Message added indicating if you’ve missed the entrance or exit of the joker lap. The AI should no longer accidently take a Joker lap when switching paths after losing control. Please note many of the changes and fixes in this update will be seamless to FSX: SE players but will be of great benefit to developers looking to bring their add-ons to FSX: SE. Improvements for using modified Scenery.cfg files which could previously result in a 1007 error when installing new scenery add-ons. Please note due to the highly customisable nature of FSX: SE it is going to be impossible for us to attempt to deal with all forms of malformatting in the Scenery.cfg files. 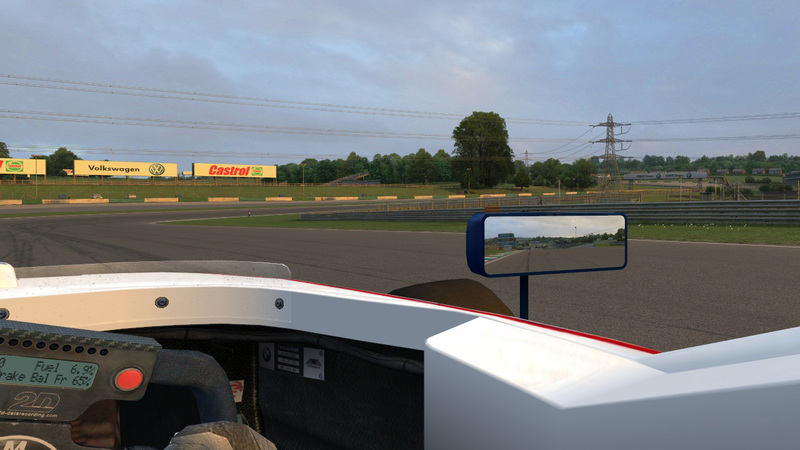 For this reason we have also provide an option to reset the Scenery.cfg file to the default version. Fixed font file loading not being VFS-aware. Font files associated with add-ons should now work as expected. Improved mouse cursor slow-down over complex cockpits. Although we have made some optimizations to this code, players may still experience some reduction in framerates when using highly complex cockpit models. This is because such models are pushing the boundaries of what is possible within the game engine. Because this update includes changes to the way Steam optimises add-on content available from the Steam store, some add-on content may re-install. This means that the size of the download will vary depending upon how many Steam add-ons you have installed. If you are just running the core simulator without add-ons, your download will be approximately 22.9 MB. This may increase up to 5.1 GB if you own all of the add-ons available from our Steam store. 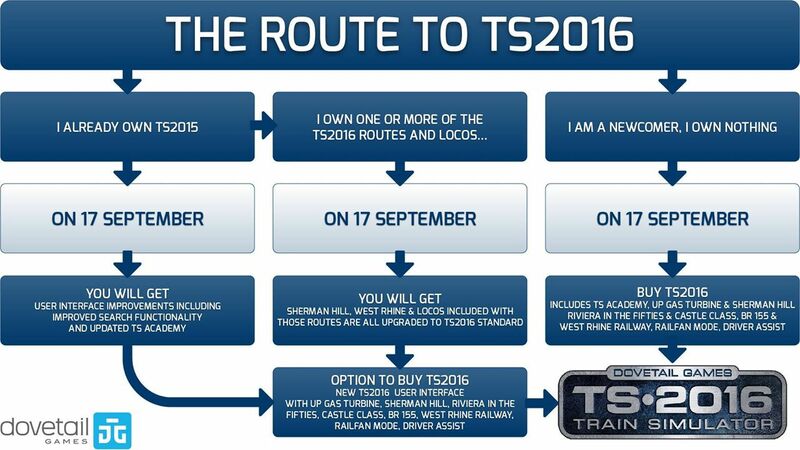 TS2016 is just around the corner and there have been many questions raised about what happens on launch day. Many of these questions are relating to whether TS2016 will be a free upgrade or not. TS2016 is being delivered in much the same way as it has been every other year. The only difference this year is instead of saving up all the patches and extra features to give you them in one go at the annual release – features such as TrackIR, Enhanced External Controller Functionality and the numerous fixes and updates – we’ve been rolling them out to you the minute they were ready throughout the year. So this means that you have already been upgraded to the latest technical standard for Train Simulator throughout the year. The launch of the final product contains the biggest package of exclusive content we’ve ever delivered. This year you’ll be getting everything that’s listed under “What’s Included” below. Throughout the last year, we’ve been steadily rolling out updates and improvements to the core software so you could get these sooner rather than wait for the full release in September. You have already been upgraded to the technical standard for Train Simulator. These improvements include key features such as TrackIR support and the Enhanced External Controller support, and many more fixes and updates. 100 Mile Sherman Hill Route incorporating Railfan Mode, Union Pacific Gas-Electric Turbine Locomotive, Union Pacific ES44AC Diesel Electric Locomotive, Union Pacific SD70M Diesel Electric Locomotive, Union Pacific SD40-2 Diesel Electric Locomotive, Union Pacific SW10 Diesel Electric Switcher Locomotive and Thirteen Varieties of Freight Cars for Sherman Hill. 40 Mile Riviera Line in the Fifties Route incorporating Railfan Mode, GWR King Class Steam Locomotive incorporating Driver Assist, GWR Castle Class Steam Locomotive incorporating Driver Assist, GWR Hall Class Steam Locomotive incorporating Driver Assist, GWR Grange Class Steam Locomotive incorporating Driver Assist, GWR Pannier Tank Steam Locomotive incorporating Driver Assist and GWR Collett, Centenary & Mk1 Coaches plus Six Varieties of Freight Wagon. Lunar Flight: Updated To Unity 5 Native VR – 6.0.1 – Available Now! Some of you may recall the issues I had with Lunar Flight when the DK2 started shipping last year in June. I was lucky to receive a Pilot kit from Oculus and had hoped to have a DK2 build ready to go when everyone else got theirs, but I ran into a few SDK problems and Lunar Flight never really has had a ‘Good’ quality build since the DK1 release. Well today all that changes with this new Steam Beta release! This build was the initial milestone I needed to finish before I begin work on future additional features and content. This is THE best DK2 Build of Lunar Flight to date! Physics Sim now runs at 75FPS to match Render Rate (Physics is not interpolated), Feels Super Smooth! NOTE: Old Replay Files will play too fast! An Oculus Preset GFX setting will be applied by default. Based on my R9 290X, feel free to adjust the settings based on your own hardware. Cockpit Shadows are now working again for the 1st time since the DK1 version! Weather is set to Clear on Mars pending a better cloud rendering implementation how ever you can change it to a different setting if you want. XBox Controllers and almost any Dual Stick gamepad should work by default. As usual to access this build you will need to opt into the ‘DK2’ beta on Steam, no command line arguments are necessary. Since this is built with Unity 5 the Update is much larger (466.7 mb) than the usual patches. This update contains significant performance improvements. Various systems have been made more efficient to reduce the workload of the graphics card and the CPU. 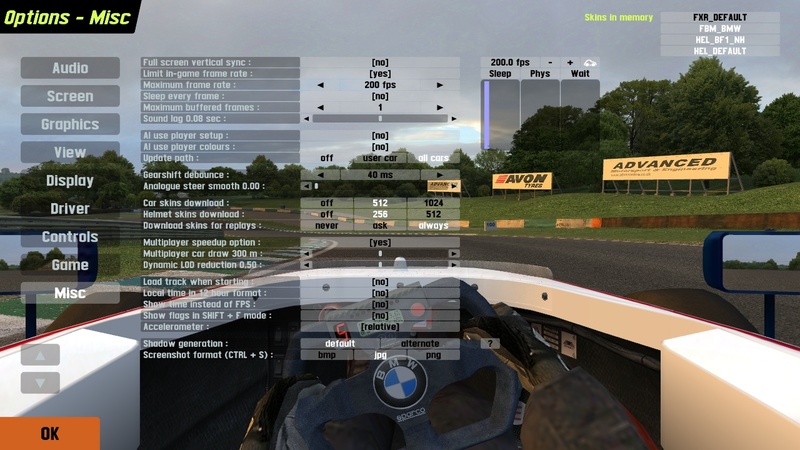 The frame rate limiter has been improved and allows Live for Speed to run accurately at the rate you set. For Oculus Rift users, you can now enter or leave 3D mode at any time without restarting LFS. This has been done by using Direct mode and the Oculus 0.6 runtime. 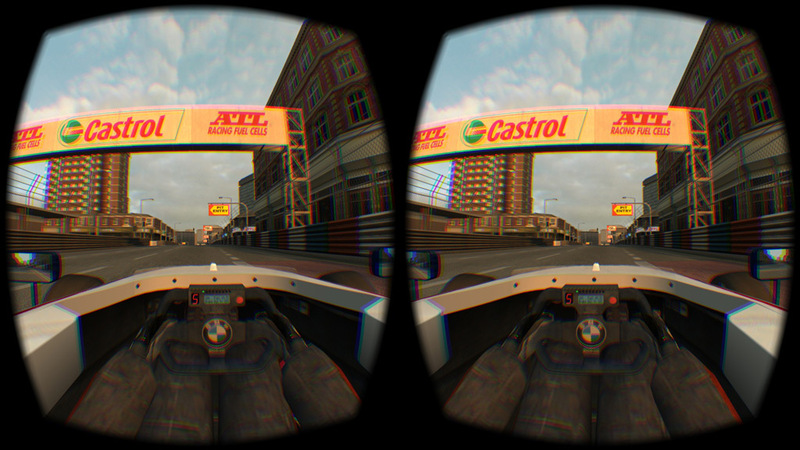 The Rift view is mirrored in the LFS window that remains on your desktop. – Click on “Multiplayer” then “List of Hosts” in LFS and choose a download mirror. – Click HERE and save the patch installer. – You can run the patch installer from its download location or from your LFS folder. 4) FULL VERSION (273 MB) – If you are new to LFS or making a fresh installation. – Click HERE to visit the download page and get the full version installer. 2) To reset your seating position, the text command /rift reset is assigned by default to the F8 key. 3) Accessing your desktop while LFS is on the Rift. The normal X-Plane beta process goes something like this for a “major” beta. Early betas – putting in a fair amount of new code and large-scale restructuring to try to address feature requests and problems. Middle of beta – fixing bugs, often the high risk and tricky ones. End of beta – try to touch as little as possible. Unobtrusive bugs, small changes, nothing crazy. The idea is to cut down the level of code bashing over time so that by the end of beta we’re not adding a new bug for every bug we fix. X-Plane 10.40 beta 6 is a little bit atypical in that it is also the first release to have digital download. Since beta 4, we cut down how much code we were changing to try to get digital download released, since the servers and installer became ready to ship. The result is that beta 7 contains the rest of that “large scale restructuring” and other code change that you’d expect from an early beta – it’s a significantly bigger jump in code than you’d normally expect from a beta that’s this many weeks old. There are definitely still bugs we have reports for that are not fixed for beta 7. Check the release notes; if your fix isn’t listed, there’s no need to re-report, it means we just haven’t gotten to it. If you put in a feature request and we said “yeah, we’ll get that into 10.40″, we haven’t forgotten – I have a big backlog of datarefs to add, for example. I think we still have several more weeks of beta; inserting the release of digital download has stretched the process out. How long beta lasts will be a question of how quickly we can stabilize. Has more than two positions. Has discrete movement (e.g. up a notch, down a notch). So besides commands added by the request of users, a number of commands were added to add “coverage” to the cockpit.